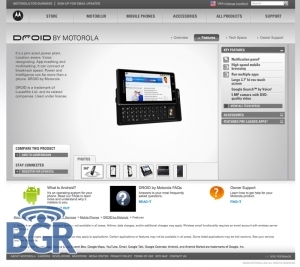 Motorola Droid web site launced, for a little while | Android Blast! The world has been waiting for the Motorola Droid to hit the streets. We've been expecting a big press event with the announcement but it looks like their web site went up before any announcement. BGR got a link to the site and published it. Nobody knows whether the site was meant to be public but it is now. Since the publication of the link the Droid site has been taken down. You can click the link below, but it comes up with an error message. It looks like the launch of the web site was a bit premature and a big "oops." In the meantime, check out BGR for screen caps at the Source link below. BGR also reports that the browser supports HTML5 and Motorola says Flash 10 support is coming in 2010.